Simply email SchoolOfLaughs@gmail.com and put “READY FOR THE MAY PERFORMANCE CLASS – SEND ME THE DEETS” in the subject line. Include your cell phone number as well. 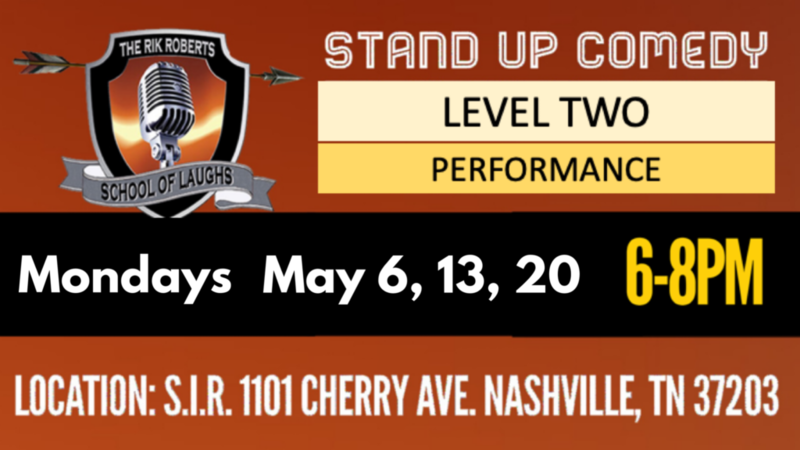 The Stand-Up Comedy Classes Level Two: Performing course is designed to get your ideas onstage. You will receive lots of pinpoint specific feedback on the material you present from myself and the other students. and a whole to more! You have an opportunity to perform a different set of material each session. Or, you can take the feedback given in class and return the next week with a new and improved set. You will also help identify punch lines and tags for the other students. Questions? Give me a call 615-293-3629. As an added bonus, you will be invited to perform a graduation show at a local comedy club! That’s right! Invite your friends, warn your enemies and see your efforts result in a fun night of comedy for all. You may still register and claim your spot by sending an email to SchoolOfLaughs@gmail.com and put ““READY FOR THE MAY PERFORMANCE CLASS – SEND ME THE DEETS” in the subject heading. I will save a seat for you and you can pay the class fee of $200 at the first class session.